To help you to detect early symptoms of nearsightedness or myopia, this mobile app reassembles Snellen Chart (traditional, Sloan, HOTV), Tumbling E Chart, Landolt C Chart and LEA charts on smart phones or tablets through randomly generating optotypes at precise physical sizes according to the test distance. You may even test your own visual acuity by yourself using the mirror mode of this app in front of a mirror. At exactly 6 meters’ distance from the “patient”, the optotype letters on the 6/6 line (Decimal 1.0 or LogMar 0.0) shall subtend 5 minutes of arc, which means that the chart should be sized such that these optotype letters are 8.73mm tall, and the topmost (Snellen Fraction 6/60, Decimal 0.1, or LogMar 1.0) "E" should be 87.3 mm tall. And an arm's reach distance may be defined in Settings. At exactly 20 feet’ distance from the “patient”, the topmost optotypes like "E" should be 88.7 mm tall, because 20 feet equals 6.096 meters. The letters and orientations of E or C ring are randomly shuffled during startup or waking-up from sleep. This makes memorizing an eye chart and cheating a vision test impossible. The app tests only shortsightedness/myopia, and does not test strabismus, amblyopia, estropia, extropia, hyperopia and astigmatismand which are common early vision conditions. 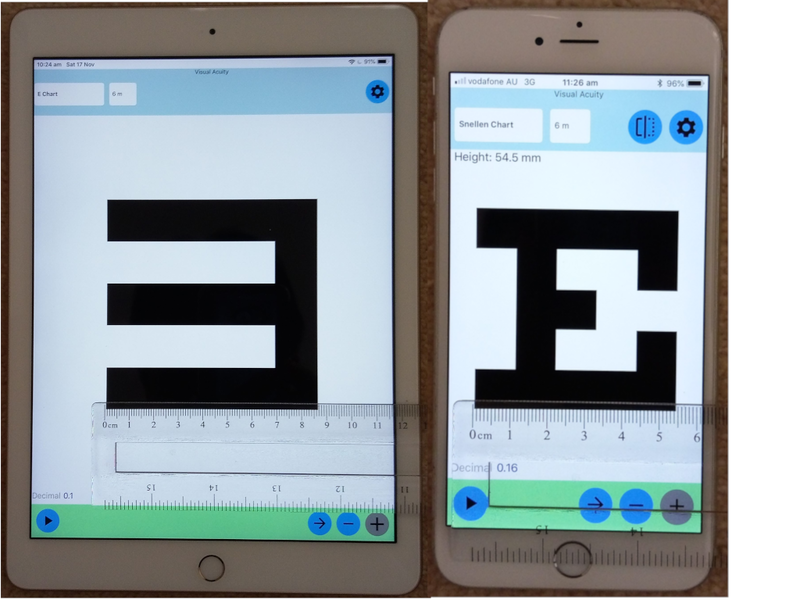 This app has been tested on various Android devices, iPhones and iPads to ensure optotype letters are printed on screens accurately. Google, Samsung, HTC, LG, Acer, Motorola, Sony, Huawei and Amazon Fire Tablets.